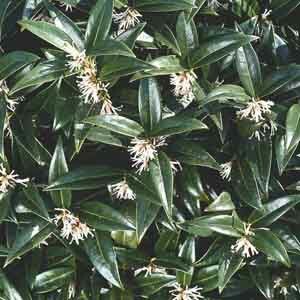 Dense, quick spreading evergreen shrub, with dark lustrous foliage. A beautiful filler for shady spaces. 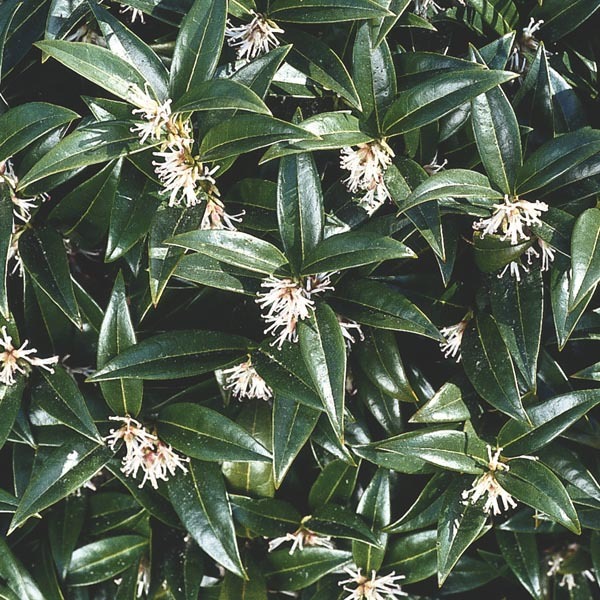 Sweetly fragrant, pink-tinged white flowers in early spring are followed by decorative black fruit. Branch trimmings very attractive as Christmas décor. Provides dramatic color and form to autumn and winter landscapes. Looks great in woodland settings. A great choice for foundation plantings or hedges. Place in an area protected from cold, drying winds. Best in fertile, humus-rich, well-drained soil. Keep soil moist, watering freely in dry weather. Prune or trim after plant has bloomed.